The explanation of the sexagesimal hypothesis is based on the temperature graph displayed on the Climatic Research Unit homepage when this post was published on March 10, 2013. On April 15, 2013, the Climatic Research Unit and the Met Office Hadley Centre have updated their HadCRUT4 and CRUTEM4 data sets. There doesn’t seem to have been a press release that covers the new data sets, and the temperature corrections are relatively insignificant. The only important change appears not in the update, but on the CRU homepage, where the new temperature graph has been changed in both cooling phases. These changes are big enough to make this graph appear as different from the original graph displayed on the CRU Web site and which was used on this post (Remember Climategate?). The new graph also shows modified yearly temperatures (in blue), which appear not to be documented in the April 15, 2013 update, either. Read the post Met Office Hadley Centre and Climatic Research Unit HadCRUT4 and CRUTEM4 Temperature Data Sets Adjusted/Corrected/Updated… Can You Guess The Impact? for more info. All climate models made by climatologists failed because they couldn’t give any reason for the sudden warming since the 70s, immediately followed by the present pause in warming. But the explanation is simple. Forced to find a justification without knowing that the climate change is cyclic, climatologists have attributed the temperature rise in 1970-2000 to anthropogenic forcings, actually mixing up a cyclic warming phase with man-made global warming. The sexagesimal hypothesis, a 60-year dual-pattern climate model, shows that climate change is the summation of two distinct cycles of alternating warming and cooling periods. 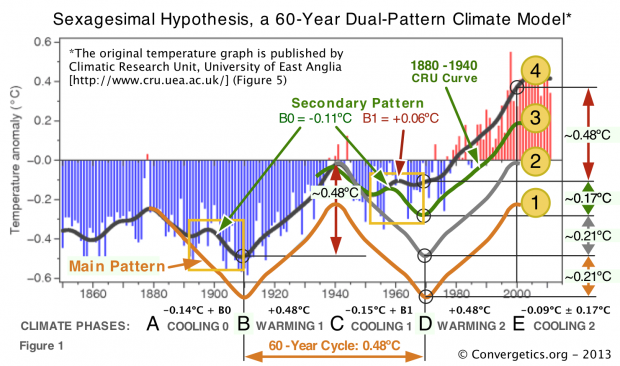 It explains, in detail, each period of the temperature statistics, and predicts 2013-2030 based on the interaction between these two patterns. The temperature rise since the 70s, which still is considered by climatologists to be generated by anthropogenic global warming (AGW), is in fact a normal 30-year warming phase, similar to 1910-1940, but its beginning was shifted upwards by the reduced cooling of previous cooling phases. To support this claim, the sexagesimal hypothesis uses the Climatic Research Unit graph, prominently displayed on its homepage since February 4, 2007 and intended to demonstrate man-made global warming. However, opposite to the Climatic Research Unit, this hypothesis uses the CRU graph to explain that the climate change is actually a lack of global cooling, not global warming.1 At first view, this “lack of global cooling” may seem curious. What cooling when everybody talks warming? Understanding that is the key for also getting why it’s so difficult for climatologists to figure out climate change. In Figure 1, the sexagesimal hypothesis, curve 4 is the Climatic Research Unit graph, which highlights in red the alarming temperature rise since the 80s. The main climate cycle (curve 1) of the sexagesimal hypothesis has 30-year warming phases followed by 30-year cooling phases. In this cycle, 1910-1940 and 1970-2000 are warming phases, and 1880-1910 and 1940-1970 are cooling phases, all of 0.48°C. Comparing the curves 1 and 4, one notices that the real warming phases 1910-1940 and 1970-2000 have also 0.48°C, exactly like the main cycle, and that the actual difference between these graphs is generated by the two cooling phases: Instead of having the 0.48°C temperature decrease of the main cycle, the real cooling phase 1880-1910 was 0.25°C (52% of the warming phase), and 1940-1970 was even smaller at just 0.09°C (19% of the warming phase). The cooling phase of 1880-1910 has clear start and end points in both curves 1 and 4, making the comparison straightforward. During the first 12 years, from 1880 to 1892, both curves had the same smooth temperature decrease. After that, the warming burst B0 in the curve 4 (highlighted by the yellow rectangle) has produced an additional temperatures rise that delayed the cooling process until 1902. After this warming burst, and through the end of the cooling phase, the globe continued to cool down with the same rate as prior to the burst. However, this delay prevented the Earth’s temperature in 1910 to complete its cooling target of 0.48°C. As a result, this lack of global cooling caused that the warming phase 1910-1940 started 0.21°C higher than predicted by the main cycle. The second cooling phase in 1940-1970 is more complex. To facilitate its understanding, we add two copies: one of the main pattern (curve 2 in grey) and one of the period 1880-1940 (curve 3 in green). In this way, the two warming bursts B0 and B1 are next to each other in the yellow rectangle to the right, making their comparison easy. To begin, we notice one more time that the first 12 years (1940-1952) of the cooling phase had the same smooth temperature decrease as in the previous phase, after which the temperature started to rise. However, instead of following the same pattern as the burst B0, the warming burst B1 was stronger and lasted longer than B0. This made the Earth’s temperature in 1970 end 0.17°C higher than in 1910 (here, the burst B0 of curve 3), and 0.38°C higher than the temperature of the main cycle (here, curve 2). Finally, the cumulative lack of global cooling produced by the warming bursts B0 and B1 over the two cooling phases shifted upwards the temperature in 1970 by as much as 0.59°C. In this way, the warming phase 1970-2000 raised higher than any of the previously recorded temperatures, creating the false impression that its warming wasn’t natural. Forced to find an explanation without knowing the effect of these warming bursts, climatologists have attributed the temperature rise in 1970-2000 to anthropogenic forcings, actually mixing up a cyclic warming phase with man-made global warming. Now, there is no way to know which of these warming bursts will repeat in the upcoming years, or if a different warming burst will occur. But, we don’t have to wait until 2030 to see how this cooling phase will end. According to the sexagesimal hypothesis, 2012 and 2013 are the years with the lowest temperature before the beginning of the next warming burst. 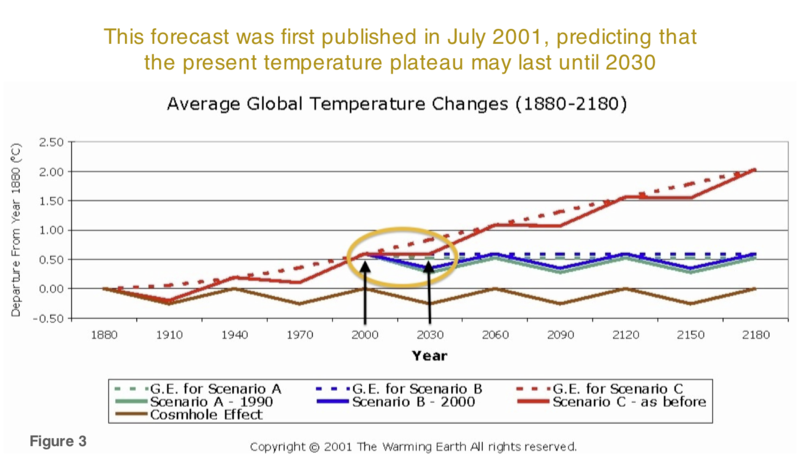 Furthermore, since 2017 is supposed to be the peak year of burst B0 (if B0 occurs), by 2020 we will know if the temperature has started to decrease. If it does, then 2030 may end 0.26°C below 2000. Despite all this evidence, one question remains: What physical phenomena trigger these natural climate cycles and especially the unexpected warming bursts in the middle of the cooling phases? The answer is complex and far from complete, but there is a theory. 1. The sexagesimal hypothesis is not based on the latest temperature statistics published by CRU or GISS, which utilize shorter averaging algorithms, because they produce erratic graphs that mask rather than highlight the real variation of climate change. Simply put, these graphs just don’t let us see the wood for the trees. 2. This prediction is based on the CRU temperature graph, and it may not correspond with the real yearly temperatures, but just with the averaged values calculated by the Climatic Research Unit. 3. The 60-year climate cycle repeated just twice within the 160-year temperature statistics, which is clearly not enough. Despite the fact that the two cycles have a high degree of correlation, new data on a longer period of time may invalidate this model. The 60-year climate hypothesis and its prediction of the 2000-2030 temperature plateau are not being proposed here for the first time. While developing the hypothesis, Alexandrescu used a shorter averaging algorithm, which identified the secondary warming pattern, but at the same time obscured the consequences of the warming bursts on the long-term warming. As a result, the author incorrectly hypothesized dual forcings: natural and anthropogenic.